A new way to think about everything! What happens in the shower? Darlene and I have been so excited about our It’s a Brain Changer podcast and since excitement always loves company we’re having a fun contest on our Instagram and Facebook pages (Sept 2018). The best part? The prize you may win! I am beyond excited to tell you how my mind thought of the winning prize. I was thinking hard about it last week but nothing was jumping out at me. Kelly, wake up! You’ve got to remember this! This is the best idea ever! And I did. For a while. And then I woke up. And then….nothing. Later that morning I was in the shower ‘aaaaaaaahhhh-ing’ under my rainfall shower head thinking of nothing in particular when BAM! The contest prize idea I had in my dream jumped back into my mind. This is the cool stuff that Darlene and I love — the brain science behind why we do what we do and how to shift our minds into a more awesome gear. Why did my mind choose to think of the perfect contest prize at 3am while I was asleep vs when I was thinking hard about it during the day? Because 1) my subconscious mind never stopped thinking about the prize and 2) it was relaxed. Our subconscious minds are always working in the background yet often when we’re awake our conscious minds come up with answers that are familiar and have been used many times before. During sleep, or other times when we’re relaxed and not thinking about anything in particular (like when we’re in the shower), the creative side of our minds are free to come up with new answers and new ways to think about things. OK….here's the prize.....A Brain Changer! Get it? 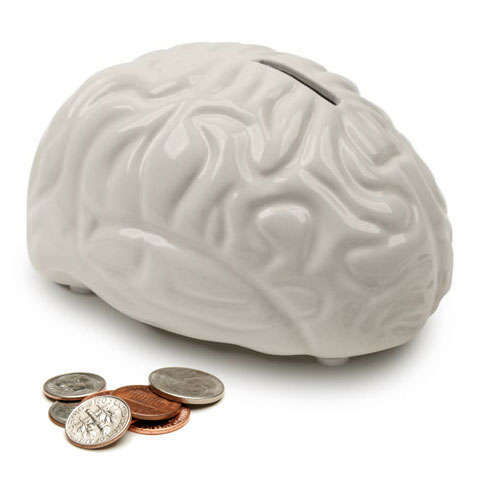 A brain that holds change! Not a BC Insider yet? Let’s fix that! Click here. What's this podcast all about? We all do it. But wouldn’t you prefer not to? Download our Free Under-Thinking Course that teaches you how to make quick and intuitive decisions every time!